Are we going to start draining the swamp, finally?? 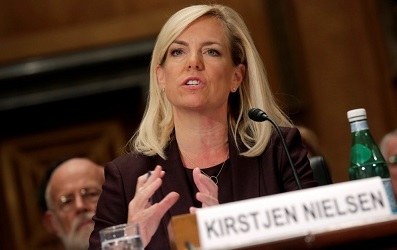 Some good news from yesterday is that Kirsjen* Nielson*, notoriously described as "Lady DACA" by the good immigration patriots at VDare.com, is gone from the Trump Administration as Secretary of Motherland Security. Peak Stupidity has had this Neilson lady's picture on file since November of last year, ready for a disparaging post about her. We'll just celebrate this good news today, as one could read about from VDare's "Federale" with Kirstjen Nielsen Out: Hallelujah, #LadyDACA Is Gone! and more from "Washington Watcher in Trump Shows New Hope On Immigration—Will He Finally Hire Kobach? (the latter with more speculation on who will end up in charge of fighting the immigration invasion). For good comments, as usual, one can go to Steve Sailer's blog post on this news. This lady was an Øb☭ma administration hold-out. What is she doing in the Trump executive branch to begin with, for 2 years now?! How was that "draining the swamp"? This makes us wonder again is President Trump just too under-confident in government matters and/or just plain stupid? He's had a business career as an executive, delegating to underlings. Does he hire these swamp creatures because he doesn't have enough faith in his own ideas and thinks he must hire "the best", meaning the long-term people of the beltway? Does he not realize that they don't want the same results as he or patriotic Americans? The President is letting his American supporters down by cranking up the legal immigration again, especially with the H-2B visa deal (oh, they are temporary, huh? Yeah, YOU go find them when they skip out on their visas.) He may be realizing he's losing this support and just doing this new anti-illegal-immigration business to placate us. I don't think it's that he's really changed his mind on controlling the border, but I think it's a matter of who's controlling him. Small steps by Trump to make us think he is really working on it (2 years later after a coupla' more million entries legal/illegal) may be OK with whoever is really running the show, as they ramp back up the legal immigration to continue their project of population replacement. I hope that's not the case, and I'll feel better if President Trump would stop tweeting and start DOING. Here's hoping, per the 2nd VDare link, that Steve Miller gets greater influence in immigration matters, along with Kris Kobach, as a likely pick for this Secretary of Motherland Security job. * See, even SHE doesn't want to assimilate. Pick an easy-to-spell name, lady. What's wrong with "Kristy" and "Nelson"? PS: I'm with you. For the life of me, I can't figure how Trump's making some of his choices (appointments and policies). I take heart from someone's description of Trump's election--Trump wasn't the wave, he just rode the wave. Haven't noticed slow loading of the site, btw. PS:Speaking of not knowing the players without a program. I didn't even know Nielsen is from my hometown in Fl. until I googled her for the hell of it sat. nite. Then I got up Sun. to find out she quit. She looks familiar, I think I bought her a few drinks decades ago. PS: That'd be pretty sad for these people, Dtbb, if that's the case (that they want to fit in, in the beltway, and therefore don't want this job on their resumes). It's not like this country is gonna last long enough, on the current path, for any of the younger ones to HAVE a career in Washington, FS. I really trust VDare on this issue, as that has been their issue for close to 2 decades now. They seem to think Kris Kobach is for real. I guess I'm going by their words, as following most of the politicians by name is not really something I feel I have time for anymore, like knowing the line-up of any decent music bands there are ... if there are any. If I can get an reply, then I'll go ahead and delete 2 out of the 3 here. Thanks in advance. PS: I really think that Trump meant those things, Mr. Blanc, but he's just too distractable (?) to have a strategy. Well, he could have had trusted underlings develop and implement a strategy, but he's been picking the wrong people by far. Was that on purpose? I don't know. PS:I think the best people that Trump could possibly convince to work for him think it will look bad on their resume and hinder future employment. It's sad. He is on his own except for his mediocre family. We need patriots. PS How does that drain the swamp? It doesn’t drain the swamp. “Drain the swamp!” is like “Build the Wall!” Someone told Trump that if he said those things, he could get elected. So he said them. Trump says a lot of things. That doesn’t mean that he means those things. I’m not even sure it means that he understands those things. The really sad thing is that Trump is the best that we’ve got.